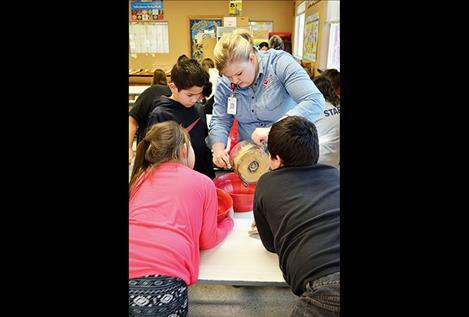 News from St. Luke Community Healthcare RONAN – St. Luke is teaming up with the Boys and Girls Club of the Flathead Reservation and Lake County to promote healthy lifestyles to local youth. Registered Dietician Jenny Robey is teaching cooking classes at both the Ronan and Polson Boys and Girls Clubs. The lessons empower young people to prepare their own nutritious foods. “The idea is to make a curriculum that’s really fun for the kids,” Robey said. The partnership arose from St. Luke’s 5210 program, which promotes healthy behavior in children. The program informs families that each day children should eat 5 fruits and vegetables, limit recreational screen time to 2 hours, actively play for at least 1 hour, and consume 0 sugary drinks. The cooking classes at the Boys and Girls Club are part of efforts to extend the reach of the 5210 initiative to all children in Lake County. The 5210 mission aligns with a health education program being implemented through Boys and Girls Club. The program is called Together Raising Awareness for Indigenous Life (TRAIL). The program works to reduce the prevalence of type 2 diabetes in Native American youth. Boys and Girls Clubs on Indian reservations across the country implement the healthy lifestyles program. Amy Vaughn, director of operations for the Boys and Girls Club of the Flathead Reservation and Lake County, teaches the TRAIL program in Polson and Ronan. She said that 60 percent of the members of local club self-identify as Native American, which makes them eligible for the program. Vaughn believes that the program will have a positive impact on all of its participants. “This is all about prevention,” she said. “We want to teach healthy lifestyles and habits so that they can make good choices.” St. Luke’s cooking classes fit into the healthy eating part of the curriculum. On the first day of cooking class in Polson, children filed expectantly into the room for their lesson. Hummus was the recipe for the day. Robey held up a bag of chickpeas and explained that they would use them to make their healthy snack. None of the children had tasted hummus before, but they were enthusiastic about preparing it. They blended the chickpeas with seasoning in a food processor to make a thick dip. The children made enough hummus for the rest of the club to eat it for snack the following day. Then they each tasted vegetables dipped in their hummus. In future classes, children will learn to make granola and salsa and can share their culinary knowledge with their families at home. Families will also receive information about connecting with St. Luke doctors to keep their children healthy through the 5210 program. Robey asserts that hands-on cooking lessons are an effective way to steer children toward a healthier diet. “Discussing what a healthy diet and active lifestyle might look like with families is important, but it’s just as important that children and families have the skill set to prepare nutrient dense meals that set them up for success,” she said. For more information about St. Luke Community Healthcare’s 5210 program call Brooke Duty at 406-528-5262. Amy Vaughn with the Boys & Girls Club can be reached at 406-676-5437. RONAN – St. Luke is teaming up with the Boys and Girls Club of the Flathead Reservation and Lake County to promote healthy lifestyles to local youth. Registered Dietician Jenny Robey is teaching cooking classes at both the Ronan and Polson Boys and Girls Clubs. The lessons empower young people to prepare their own nutritious foods. “The idea is to make a curriculum that’s really fun for the kids,” Robey said. The partnership arose from St. Luke’s 5210 program, which promotes healthy behavior in children. The program informs families that each day children should eat 5 fruits and vegetables, limit recreational screen time to 2 hours, actively play for at least 1 hour, and consume 0 sugary drinks. The cooking classes at the Boys and Girls Club are part of efforts to extend the reach of the 5210 initiative to all children in Lake County. The 5210 mission aligns with a health education program being implemented through Boys and Girls Club. The program is called Together Raising Awareness for Indigenous Life (TRAIL). The program works to reduce the prevalence of type 2 diabetes in Native American youth. 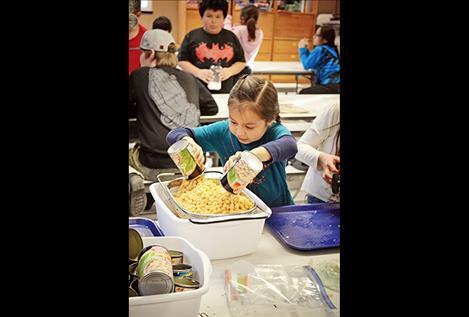 Boys and Girls Clubs on Indian reservations across the country implement the healthy lifestyles program. Amy Vaughn, director of operations for the Boys and Girls Club of the Flathead Reservation and Lake County, teaches the TRAIL program in Polson and Ronan. She said that 60 percent of the members of local club self-identify as Native American, which makes them eligible for the program. Vaughn believes that the program will have a positive impact on all of its participants. “This is all about prevention,” she said. “We want to teach healthy lifestyles and habits so that they can make good choices.” St. Luke’s cooking classes fit into the healthy eating part of the curriculum. 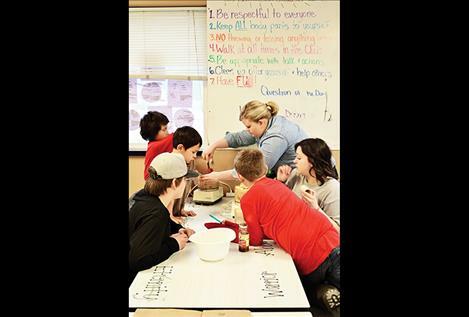 On the first day of cooking class in Polson, children filed expectantly into the room for their lesson. Hummus was the recipe for the day. Robey held up a bag of chickpeas and explained that they would use them to make their healthy snack. None of the children had tasted hummus before, but they were enthusiastic about preparing it. They blended the chickpeas with seasoning in a food processor to make a thick dip. The children made enough hummus for the rest of the club to eat it for snack the following day. Then they each tasted vegetables dipped in their hummus. In future classes, children will learn to make granola and salsa and can share their culinary knowledge with their families at home. Families will also receive information about connecting with St. Luke doctors to keep their children healthy through the 5210 program. Robey asserts that hands-on cooking lessons are an effective way to steer children toward a healthier diet. “Discussing what a healthy diet and active lifestyle might look like with families is important, but it’s just as important that children and families have the skill set to prepare nutrient dense meals that set them up for success,” she said. For more information about St. Luke Community Healthcare’s 5210 program call Brooke Duty at 406-528-5262. Amy Vaughn with the Boys & Girls Club can be reached at 406-676-5437.